HAMMETT, PA (July 29, 2016) - For the first time since June 19, the “Low Rider” Dale Blaney earned his place in Arctic Cat All Star Circuit of Champions victory lane, this time at the Eriez Speedway in Erie, Pennsylvania, during round one of the I-79 Summer Shootout presented by Classic Ink USA. The Hartford, Ohio, native, who started third on the feature grid, took command of the 30-lap main event on lap 18, driving under race leader Sheldon Haudenschild at the exit of turn two to solidify a $5,000 payday. For Blaney, the victory was his sixth of the 2016 Arctic Cat All Star Circuit of Champions season, bumping his career win total to 133. It was the first All Star appearance at Eriez Speedway since 1981. Sheldon Haudenschild and Kraig Kinser led the 23 feature starters to green at Eriez Speedway on Friday, July 29. 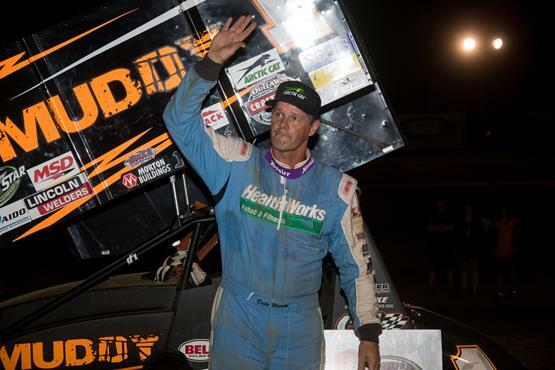 By the completion of lap one, Haudenschild had already established a clear advantage, utilizing his all-too-familiar top groove of the speedway. Dale Blaney settled himself into second, followed by outside polesitter Kraig Kinser. Those three would eventually create some separation, racing in that order until lap 15 when Kinser made contact with a lapped car causing the Bloomington, Indiana, native to get upside-down. Kinser walked away unharmed. Green flag conditions returned to the speedway with Haudenschild still on the point, followed by Dale Blaney and now “Downtown” Danny Holtgraver, who moved forward from sixth on the grid. Despite a few attempts to work underneath Haudenschild during the first 15 circuits of the 30-lap main, Blaney made his first true bid for the top spot on lap 18, driving underneath Haudenschild as he slipped over the cushion between turns one and two. From that point, Blaney raced forward carefully; navigating traffic through the bottom and middle lanes of the speedway while still holding off challenges by Sheldon Haudenschild and Danny Holtgraver. Those three raced nearly nose to tail for several circuits until caution lights reappeared on the final lap, creating a green-white-checkered scenario. Unfortunately for Holtgraver, he was the victim, spinning at the entrance of turn one after making contact with a lapped car. The first green-white-checkered attempt turned unsuccessful, leading to a second. Back-to-back two-lap shootouts proved to be no distraction for Dale Blaney, eventually rolling under the final checkers on top of the running order. Sheldon Haudenschild finished second, followed by Cap Henry, Cole Duncan, and Chad Kemenah. The inaugural I-79 Summer Shootout presented by Classic Ink USA featuring the Arctic Cat All Star Circuit of Champions will continue on Saturday evening, July 30, with a visit to Pittsburgh’s Pennsylvania Motor Speedway near Imperial, Pennsylvania. “Dirt’s Monster Half-Mile” will showcase “America’s Series” for the 15th time in the track’s storied history on Saturday evening, awarding a $5,000 top prize, as well as points toward the $3,000, I-79 Summer Shootout championship point fund. Dale Blaney is the most recent Arctic Cat All Star to visit PPMS victory lane, earning top honors on August 2, 2015. Pittsburgh’s Pennsylvania Motor Speedway will open pit gates at 3:00 pm on Saturday afternoon, July 30. The drivers meeting is set to begin at 5:30 pm, followed by hot laps at 6:30 pm. More news and information can be found on the Web at www.ppms.com. 1-Dale Blaney ; 2. 19-Joe Kubiniec ; 3. 11K-Kraig Kinser ; 4. 60-Kory Crabtree ; 5. 19m-Brent Marks ; 6. 44-Joe McEwen ; 7. 1R-Gale Ruth Sr.
10-Carl Bowser ; 2. 8M-TJ Michael ; 3. 70-Danny Holtgraver ; 4. 22S-Brandon Spithaler ; 5. 4-Danny Smith ; 6. 49H-Bradley Howard ; 7. 5X-Gale Ruth Jr.